The broomstick drill shows you what a neutral spine should feel like. From the outside, a neutral spine should look like a relatively flat back — no excessive arching or rounding. The spine itself is still curved, but nothing should look overly pronounced. 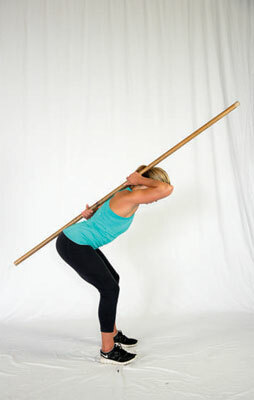 1Grab a broomstick (or something of the sort) and line it up on your back so that it touches three points of contact. Make sure you find a broomstick long enough to reach from the top of your head down to your tailbone. The first point you want the broomstick to touch is the very back of your head, the second point is your upper back (your thoracic spine), and the third point is your tailbone (sacrum). 2Hold the broomstick with one arm behind your neck and one arm behind your low back. Don’t overarch your lower back. 3While maintaining these three points of contact on the broomstick, start to perform a few sets of hinges. If at any time the broomstick disengages from any of the three points, reset and try again. Pay extra attention to your tailbone, because many times that’s the first point of contact to leave the stick.